NANTES, France (AP) — Vahid Halilhodzic is taking over as Nantes coach after the French side replaced Portuguese coach Miguel Cardoso on Tuesday following a poor start to the season. Nantes won only one of its first eight games under Cardoso and is languishing in 19th place in the first division. Nantes says Halilhodzic, one of the best strikers in club history, has signed a contract until 2020. Halilhodzic scored 111 goals in 192 games for Nantes and twice finished as the French league’s top scorer. He helped Nantes win the league in 1983 and last year he was voted by fans in the club’s Legends XI. The 66-year-old Bosnian previously coached in France with Lille and Paris Saint-Germain, and had a bad end to his time with Japan. He filed a suit against the Japanese soccer association in May , claiming his firing damaged his honor and reputation. 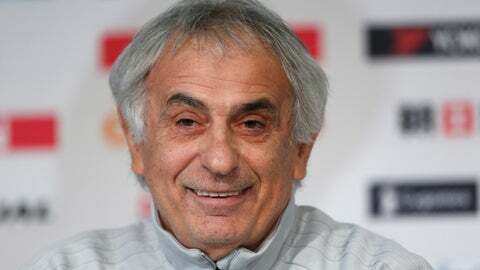 Halilhodzic was fired on April 7, two months before the World Cup in Russia, despite leading Japan to a berth in the tournament.